Have you ever done something crazy for a friend? Taken your life in your hands for a friend? It's a rare thing. And I am not usually disappointed. I did one of those things tonight. My friend Catalina had been taking guitar lessons. She and I met through the church choir, so I know the girl can sing. And she was set up to join her teacher and his band to play the open mic night at the Stone's Throw, a bar downtown. Downtown B'burg, I should specify. Lest you think I'm really bonkers and tootled into Indy in a snowstorm. Anyway, there was a snowstorm. C wasn't due on until 10, and by 9, we'd gotten the boys down, I wanted to take off my bra and put on my pajamas. I sat down at the computer instead. She'd cancelled the event, because she didn't want to see all the former Yeses turning into Nos. It was making her Nervous. Well, I couldn't have that. So I decided to go. I even put on makeup. I tell, Crazy Stuff! I left the house at 9:30, leaving plenty of time to crawl across town in a snowstorm. It felt so weird to go out that late. I'm pretty sure it's been like college since I went to a bar, let alone left after dark. Well, wait, no, Kathleen and I went to that dueling piano bar, but this was Different. This was a Bar's Bar, all smokey and everything. I am just not the drinker that I used to be. And I was not going to touch anything that might impair my driving, when it was already icky. I had to drive Eric's car 2 fisted just to get there, it was snowing. When I stopped to turn left, I fishtailed a bit, just getting there. I did see a snowplow, but he was coming from Pittsboro and going south, not any of the roads I needed. But I made it. And I got to see my friend sing. I was glad I left when I did. God was watching to make sure I made it home safe. The roads were bad. And I wiggled at the first light, luckily no one was around. I Prayed Unceasingly all the way home. I was so worried I'd lose control of that little car on the rest of the way home, but God was With Me. He made sure the lights all stayed green, so I could just keep on plowing through. No cars were out in my neighborhood, so there was no trying to pull over to get past. I made it home in one piece, and had to hose myself down to wash all the smoky smell off. I'd forgotten how it permeates everything. Whew! But I'm glad I went. Obviously, I was Meant to go and support my friend. I'm glad I did. She did a Great job! I can sing at church, it's an easy audience, they all love me, and aren't inclined to throw tomatoes or bottles. But singing at a bar, with a band, in public. No. I don't think so. She's a better, braver, man than I. And she did Wonderfully! Getting back in to the groove. We had Piper for a week before Valentine's Day. Then I got a week off. Then we got her back for a few days this past week. She really fits in well around here. Tuesday, we went to our BAM playdate, Butler Alumni Moms, at my friend K's house. She obviously has girls. How fun it was to take a girl to girlapalooza! She had fun playing Doc McStuffins and Dress Up. And Jake joined her. He'd never been interested in dress up before. Then again, he's not a girl. It was an entirely new kind of playdate for him. Plus there were Pitty Desses, as Lisa would call them. It was fun to have a little girl around. This was a snap on our way home that day. "Snazzy Piper" That's what she called herself when I put these glasses on her, I had given them to her to play with so she wouldn't fall asleep on the way home. Snazzy Piper stayed awake. For the most part, Pipes does not watch tv. Or at least, not with us. But Jacob likes to watch Yo Gabba Gabba and Octonauts. She decided this week, that she likes Mickey Mouse, she saw him on something in Jake's room. So, in an effort to bring the littles up to a level of cool, I popped some of my old school Mickey Mouse cartoons in to watch. Piper was hysterical as we watched the episode where Mickey directs the Band during a tornado. Pipes starts yelling at the TV, "It's OK Mickey!" and "It's Just an Accident! I help you!" So sweet, and she makes me smile. It's nice to have a little girl around. Nothing says a wonderful arctic morning, like fresh-baked cinnamon rolls and a 2 hour delay. To celebrate this gift of time, the boys all curled up to play Lego Harry Potter on the wii. And I do mean ALL the boys. Even Jacob grabbed a controller and thought he was playing along. Even though we had a 2 hour delay, the boys still had to go to school. This was all that they were able to pull together to make a snowman when they tried over the weekend. A Snowmound. But they figured out that they could have a bit of fun playing on it, while they waited for the bus. Pretty cute. 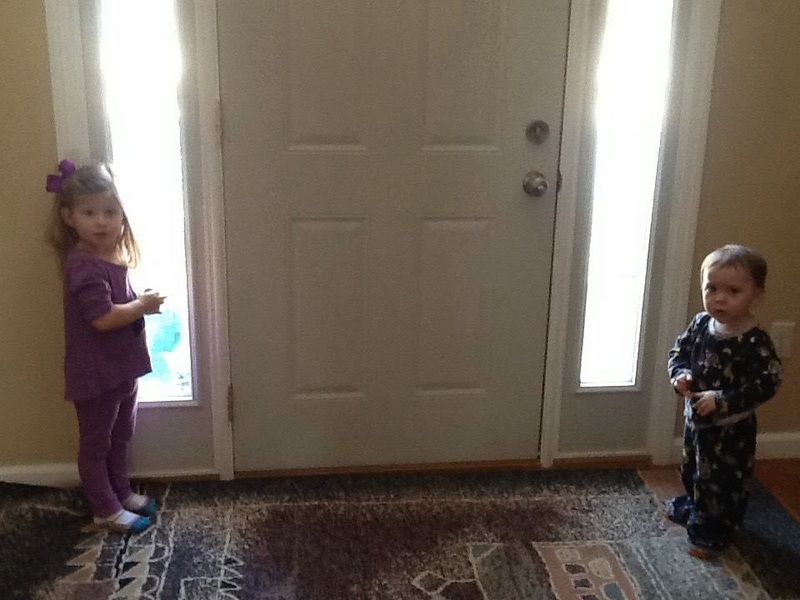 These two wished they could go outside and wait for the bus too. It's been a while, hasn't it? We got snowed in this weekend, and my oily things took a much needed break to just hang out with my Boyz. Saturday morning, we watched the snow fall. It was Perfect, we didn't really need to be anywhere. The storm hit early in the morning, so that it was still blowing and bustling when we got up for breaky. Jacob stood in the doorway of the front hall talking to the snowstorm, a lot of Woah, and Oh Yeahs. It was pretty adorable. The big boys had been hoping and praying that it would be the snowman kind of snow. Alas, it was not. It was too dusty for that. We spent the morning, and early day snuggled up by the fire in the living room watching cartoons and movies. 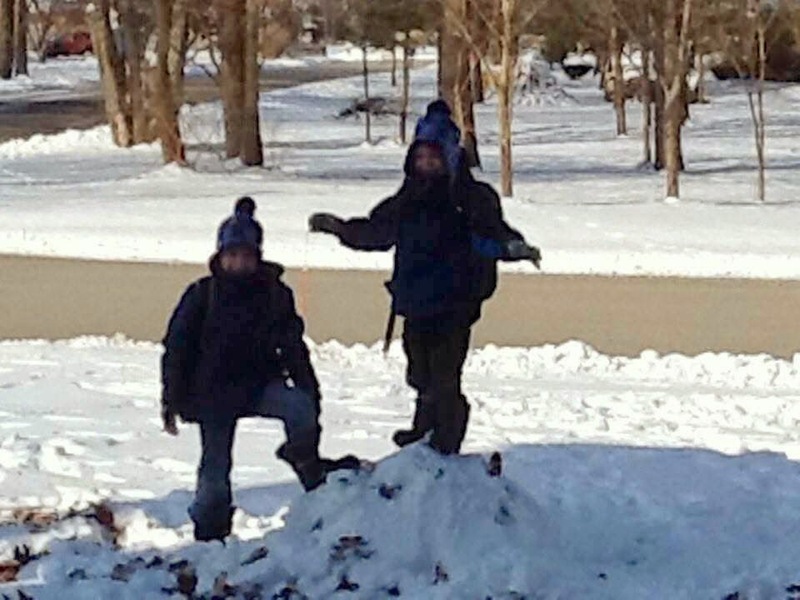 But once the snow stopped, and sun started to shine, nothing could stop them from going outside after quiet time to play in it! This cracks me up, they took their snowshovels out into the yard and just played with them. And Jacob wanted to go too. Sam was spinning around in circles with his shovel. Pure snowy joy. I did talk them in to coming over and snuggling up with Jacob. He didn't have to work too hard to make a snow angel. After I came out with Jacob, the boys decided to go get their sleds, and go zipping down the small hill in the backyard. It's not a huge sledding hill, in fact, we've never had good luck on it before, until this weekend. Then they finally figured out how to work it. Sam sled down first, didn't even wait for the rest of us to get up to the top. I had bought Jacob a long sled a few days prior, and when I pushed him down it, he went flying. The two of them had started down at the same time. Sam surrendured, being cold enough, and went inside. But Chris decided to go down with Jacob. And thus began a new era....The era of brothers playing with each other! They must've gone down together 10 times, with Chris pulling Jake back up the hill each time. Jake would grunt, and Chris understood that it meant, Come on, let's go again! My view from next to our sledding hill. And they were catching the light, so beautifully Saturday night. Chris and Jake were having such a great time sledding down that hill! Chris was so self sufficient that I was able to go back up towards the house. Somebody had to start the cocoa - but imagine my surprise when Eric already had! The boys went down a couple more times and joined me. Me and my pajamified cocoa buddy. Jacob decided he likes cocoa too. I spiked his chocolate milk with a little hot cocoa, so it was like warm milk, and he was perfectly content. We all dig our hot cocoa after playing in the snow! On Sunday, the boys went to church, and when they came home, they played outside for a bit again. This time, I'd been sleeping, and missed the memo. So I tossed some tea together for them. Turns out they love hot tea almost as much as Aunt Lisa and Mommy. There's just something about drinking a warm beverage that warms you from the inside out. Eric was kind enough to refill the Birdfeeder for me the other day, and we got a little dusting of snow. And the next day, we had visitors. This was an unusual one for me. But I looked it up on Whatbird.com, and come to find out, it's a Tufted Titmouse. Now that's just Fun to say. The Juncos go for the scraps. A House Sparrow and a Goldfinch at the buffet. The Juncos get scared off pretty easily, but they stay close. Mr. and Mrs. American Goldfinch. And the Titmouse is back. The Nuthatch looks quite large next to the Goldfinch. But he likes to grab a snack, and then zip elsewhere. Last but not least, one more Tufted Titmouse for the road. Our weekend started early, and really, isn't that the best kind? The boy's had their Valentine's Parties at school on Friday afternoon, so I had reserved my mother in law to watch Jacob while we both participated in the school parties. Then I'd taken on Piper. And when discussing the gig, she offered to take her on the 13th in advance, so Eric and I could still help out at school. I forget if I'd mentioned this before, that Eric and I are Co-Room Parents for the boys classes. We agreed back in the fall, since we'd be off for the parties anyway, if we could round up a third party to Jacob sit, then we could go to the class parties. One of us would go to 3rd grade, and the other to kindergarten for the Christmas party, and then at Valentine's we'd switch. This time I got to go to Christopher's class. Third Graders are something else! God Bless those teachers. There were a couple kids who were so disrespectful they were talking like teenagers. All of a sudden, they went from 8 to 18! Nope, I didn't like it. But I did like their teacher. He commanded their attention, in a loving way. They didn't always talk respectfully, but if their teacher got stern, they snapped to it. It was a great class. We divided into groups. We had the snack station, a card/flower station, and a game/bingo station. And we just swapped out every 20 minutes. I brought strawberries, and sparkling grape juice, and pretzels. Another parent brought chocolate covered strawberries. It was rather special to have the sparkling drinkies in class. I'd even found those plastic wine glasses. Way cute. I got beads for prizes at the bingo game. Mr. J put them all on and distributed as necessary. He was cracking me up. I manned the craft station - we made Bling Rings. This was mine, an upside down hershey's kiss, wrapped in pipe cleaners, and wrapped around a finger like a big clunky ring. The kids all got a kick out of it. I was worried the boys wouldn't like it. But they did. Chocolate is everybody's favorite kind of jewelry! After school, we came home to find that though Jacob hadn't napped, Piper did, and she had gone home already. We invited the Julius family over to play. They brought heart shaped pizza. I love having pizza from Monical's. Lots of yummies, and we played, and the kids played and it was fabulous. The kids were so good together, they let us play half a game of Shanghai Rummy. The kids played in the basement for a while. Then they curled up and watched tv with Jacob. Turns out everybody loves Yo Gabba Gabba and Octonauts, just like he does. After our friends had to hit the road, we got the kids all dolled up in their winter jammies and put them to bed. Miles to go before they slept. But they actually slept in a bit. They must've been Worn Out! And we made a special holiday breakfast. No holiday is complete without honey flakey biscuit egg sandwiches. Daddy opened his present - a Young Living USB diffuser for his computer at work. I got him some oils to help - RC for breathing, Peppermint, and Orange for focus. These should perk him up, as hard as he's been working. He seemed happy about it, I'm excited to hear how this diffuser works. For each other we got a new coffeemaker, and a new coffee grinder. The old one had died. But if you get a Daddy a coffeemaker for Valentine's Day, he's gonna need some coffee to go with it. I found Meijer had bulk beans, including my new favorite Michigan Cherry. Yeah baby. My house smells GOOD when that stuff is brewing. The boys got a Cars table. Literally, it's Disney/Pixar Cars. And it has holes in the table where they can drop Hot Wheels (or Cars cars) into the center of the table, and watch as they shoot out down a ramp and across the floor. It's a big hit! There were also chocolates and light up pens for the boys. Chris and Jacob just played for a while. Together. Played Cars. Played swordfight with their lightup pens. They just played, together, and it was good. It was unusual, a first, but a great first. This was my present from Eric. He had to hunt pretty hard to find me a rack for my oils for our bathroom. He wanted it to be less than 12 inches wide, so that he could fit it on the bulkhead next to my sink. It worked! The boys decided they really didn't feel like doing much fancy for Valentine's. I thought they'd like to go to the Museum. Maybe go to Steak-n-Shake for dinner? Nope they wanted just hang out at home all day and play. OK. That's fine too. Actually, Christopher wanted to read. He was almost done with the third Harry Potter book. Sunday morning, the boys were singing with the other Sunday school youth. Pastor is going on sabattical this spring, so we're going to be doing a Ancient Greece/Paul's times, VBS for the whole church to learn about it. And the kids are getting a head start, doing greek dances and some songs that sound very Greek. They actually got to sing at all three services. They did a Great Job! They sang about Loving your neighbor as yourself. Eric said he got really dizzy watching this dance. I could totally understand why! They were so cute singing at both services. It's easy to spot the boys in their matching red sweaters. I put the boys in matching sweaters on purpose, so they are easy for me to spot. But as it turns out, it's not easy for others. Sunday night, the church had a Valentine's Party for the kids at the church. It was a dropoff thing, so that Eric and I could go for a date, from 5-8, all by ourselves! They took all three kiddos and played with them, sugared them up ;) , and gave them back. It was Awesome! Eric and I decided to make the most of our Valentine's date night, and we drove down to Greenwood to Thai Spice. It's been so cold lately, sunny, but stone cold, all we wanted is some good Tom Yum soup. I love that fresh limey and lemongrass taste, with just a bit of heat. Oh yeah. Some thought we were crazy for going far, but we did. And it was Good. It was a Harry Potter weekend! Chris finished the book, and we watched the movie. And then both big boys just Had to play the video game too. They spent most of Monday doing that. Sam hadn't seen the movie, but it didn't matter, he digs a good video game. Sorry, no one can take this kid serious. But this was what he was doing, while his Bows (brothers) were playing video games. Meanwhile, I broke out the camera, and did some picture taking in manual, of the beautiful bouquet of roses that Eric got me for Valentine's Day. This was a beautiful red/orange rose that opened up on Sunday morning. Still Gorgeous Monday.